Emerald and Shoplet partner to offer online customers a full branded line of sustainable products. 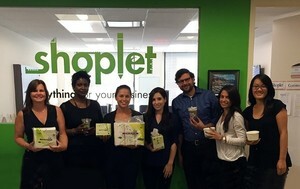 The Emerald team visits Shoplet headquarters in New York City. Syosset, NY, Oct. 31 /CSRwire/ - Emerald recently announced their latest partnership with Shoplet, a leading e-commerce website that sells over 1,000,000 products including furniture, technology, paper, breakroom supplies, cleaning products, medical equipment, and much more. Unlike other brands who offer recycled “green” products, Emerald offers state of the art finished goods made from rapidly renewable agricultural by-products, providing a revolutionary solution in sustainability. “We go above and beyond the status quo to find and bring to market the most innovative and environmentally conscious products in the industry. We are continuously looking for new, forward thinking partners like Shoplet, who shares our values and is committed to bringing our mission to life,” states Ralph Bianculli Jr., Managing Director of Emerald Brand. Established in 1994, Shoplet offers a variety of specialty items, such as office supplies, printer paper, technology, office furniture, ink and toner supplies, and cleaning and maintenance supplies. The leading e-commerce company, whose mission is to offer socially responsible solutions to consumers and businesses, offers free next day shipping on most orders over $25, a selection of over 1,000,000 products, and an unbeatable 110% price match guarantee, all backed up by our best in class US based customer service team. Shoplet products are available for purchase at www.shoplet.com.